An integrated solution is the ultimate end goal of a well designed system. A good integrated solution analogy is a car where a single wheel can be replaced independently and engine parts can be replaced without having to replace the whole car if a single part breaks. In technology a well designed system is generally a non proprietary system where multiple parts fit well together. In today's world where many choices exist, an integrated solution can be a challenge. One simple example can be audio formats, to name few audio formats, wave, WMA lossless, WMA, FLAC, Mp3 etc.... So which format to choose when backing up an audio collection to be used by streaming devices around the house? There is no best format, but there is a format that can play on most players which is usually the non proprietary format. Sometimes there is limited choice, a good example is Blu-Ray media format , the Blu-Ray became a monopoly but not so long ago it was battling its main rival HD-DVD. Where is HD-DVD today? No one could have guessed the winner outcome with certainty few years back. So if one would have spent money on an HD-DVD player, this money has been wasted. These are just small examples of the many choices or no choice available these days and constantly changing. What would a consumer do, and what is the best approach for tech savvy customers. This is where integration experts come into play. The job of an integration expert is to foresee the future and avoid as much as possible a dead-end system where a user has to completely change his system when new solutions emerge. This can be easily overlooked by many if not all consumers. The integration expert ultimately saves the user money and headaches going into the future. The main benefit of an integrated system is centralization, whereby many services can be accessed from a single interface. A good example is a playstation 3 where the user can play games, watch DVD movies, stream online movies, stream local media files and browse the internet from the single ps3 interface. So buying the PS3 is a great deal for those wishing to use all of its services. Nevertheless, in order for the ps3 to work seamlessly it has to be part of a system where access to the local files is made available as part of an integrated network. Network Storage-This is where all the shared files are stored. They are readily accessible by any network connected device, whether it is a media file or a data file. Also the network storage is a key data backup solution. Internet Security Guard- This is the box that protects the local network from the external internet threats. It can also be custom configured to provide children's internet access added security. 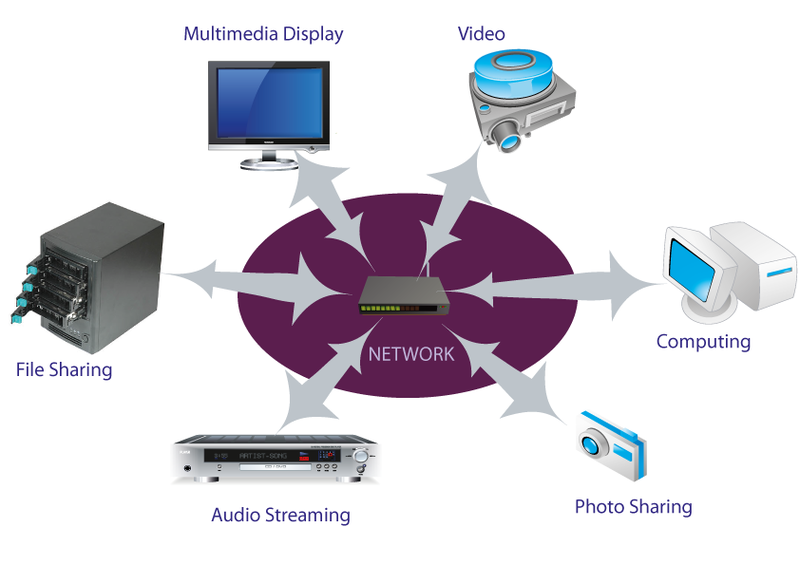 Media Streaming Devices- These are the devices that are used to play music or videos from the local network or from the internet. They can be placed anywhere where the local internet connection is reachable. Computing Devices- They can be desktops, laptops, computer peripherals or smart phones. They are all connected to the network and can access the common storage and media files. Also they are connected to the internet to provide e-mail web access and work access. All the above elements are part of an integrated system and in such as a system new components can replace old components and integrate in the system with minimal user effort. Our service includes assessing the customer system needs and providing a custom made solution. The pricing depends on the system provided and the complexity involved. We will provide estimates on a customer basis once the system requirements are defined and evaluated. Please contact us for further inquiry.